Meanwhile, this afternoon, the Pickwick Theatre in Park Ridge, IL, will celebrate Power's centenary with a screening of two of his great popular hits, In Old Chicago (1937) and Jesse James (1939). Copies of Romina Power's limited edition memoir will also be on sale at the theater. On Monday, May 5, Power's birthday, Lady Eve's Reel Life and They Don't Make 'Em Like They Used To will host a blogathon - Power-Mad in his honor. Check back then for links to posts by the dazzling roster of bloggers who will pay tribute to his films and his life. On Thursday, May 8, Movie Memories will present a red carpet showing of Blood and Sand at the 20th Century Theater in Cincinnati, Ohio (Tyrone Power's birthplace) which was the first feature shown at the 20th Century during its grand opening in 1941. Power’s children (Romina, Taryn and Tyrone Power, Jr.) will host a private reception prior to the screening. During their visit to Cincinnati, the Power family will also tour the places where their father lived and attended school. On Saturday, May 10, Movie Memories will present two of my personal favorites, The Black Swan (1942) and The Rains Came (1939) in a commemorative screening at the Lincoln Theatre in Massillon, Ohio. All three of Power's children will appear at the event. 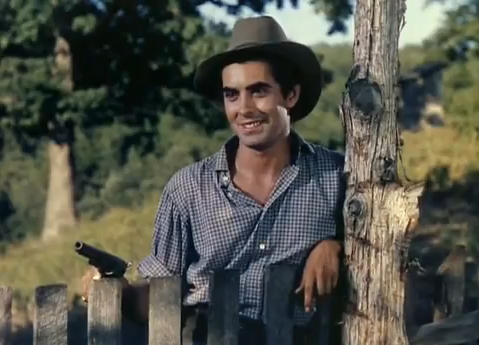 Coming later this year, and also presented by Movie Memories, on August 8, Tyrone Power will be honored as part of the annual "Jesse James Days" in Pineville, Missouri, where Jesse James was filmed. Sure wish I lived close enough to attend those events!! Drooling just thinking about those screenings!! I'm ready to fly to Ohio just to see The Black Swan and The Rains Came on the big screen.